Help improve Atlas Obscura by expanding Graffiti Alley - Ann Arbor with additional information or photos. 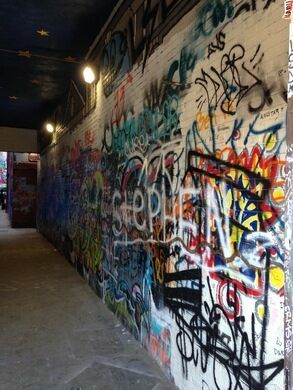 Tucked off of East Liberty Street in Ann Arbor, Michigan, is an alley covered in graffiti. The space was originally painted in 1999 as an original work by artist Katherine Cost titled “Infinite Possibilities” but was painted over a few years later. 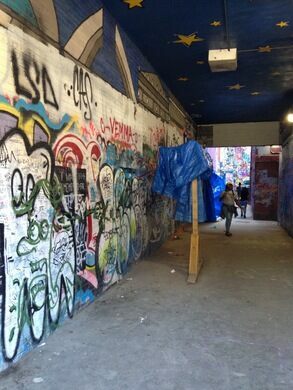 The alley remains a unique place for artists and has continued to evolve as new artists leave their mark. A narrow passage next to a cafe leads to a courtyard exploding with murals, tags, and paste-ups. One of São Paulo's tight urban intersections has become a haven for graffiti artists ever since a single Batman started the trend. Thanks to a loophole in the property ownership this alleyway has become a cacophonous street gallery.